Ned is also a hilarious guy. He compiled his experiences in high school in a book called Teen Angst? Naaah. Just the title alone is interesting enough for you to want to read the book. In the book, Ned talks about everything from dealing with high school (otherwise known as hell on earth) to what happened the first time he smoked marijuana ("waking up at 2 a.m. with a 103 degree fever and stumbling through the hall to pee.") It’s a book that a teen will actually feel is worth the effort of reading. Ever meet a happy, cool nerd? The great thing about Ned is that even though he was a total dork in high school, he still managed to be happy and cool in his own way. In the book he describes how he couldn’t even get a girl at his school, but was invited to a swanky party thrown by the New York Times. At the party, Amy Sohn, a columnist who wrote some "amazing dirty stuff," offered to loan him her body if he wanted to lose his virginity. When he called her up later to take her up on the offer, she apologized and explained that she’d been drunk. Ned was happy though, because he had done everything right, and an ADULT had made a mistake. The book ends with Ned graduating from high school. In the last chapter his demented family visits Hooters, where Ned is mistaken for a 13-year-old by a waitress named Crystal. Contacted by e-mail through his Web site, Ned explained how he got started writing this book. He had been writing a weekly column for the New York Press. "I had this sort of other life as a writer that I didn’t talk about much, because my friends weren’t entirely happy about appearing in articles in local newspapers. I would work in school like everyone else, then go home and write for six hours." Writing helped Ned deal with a lot of stuff in high school. "I got hit with a lot of depression while in high school, from TV. I would come home and watch teen-oriented programs and then go to school and be like, what is up with all these ugly people? How come they aren’t pretty like on TV? How come nothing exciting happens in my life? How come I don’t have a girlfriend? How come when I talk to girls they don’t tilt their heads and smile at me, like on TV? I think, if I didn’t have writing, I’d be in a bad place, y’know?" After Ned wrote an essay for the New York Times Magazine, a book publisher called Free Spirit approached him about publishing his writing in a book. "I told them I already had all these essays, so maybe we could compile them and make a book (so I wouldn’t have to write a new one myself, phew). We had to cut some essays and write a few new ones for the end of the book, but mostly we used material that I already had. So it was pretty easy. Even so, it took two years and two editors to go from the essays to the finished product." Since the publication of his book, Ned has been featured in such publications as Teen People and GQ. He has spoken at schools and read from his book on radio and television and in libraries and bookstores. Being a successful author, he enjoys a strange kind of celebrity. "Once a junior high school girl tried to kiss me in the hallway after I spoke at her school. I was like, where were you in junior high school? And then I stepped aside. I hadn’t seen a mouth full of braces in a while." 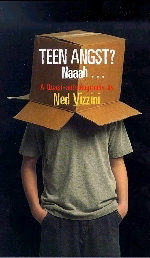 Ned is very secretive about the topic of his next book but did say that it is bizarre fiction set in high school. "Now I’m working on a novel from scratch and that’s harder. George Orwell once said that the only reason a man would write a book was if he were possessed by demons, and I can empathize with that." Ned is writing the book while attending Hunter College in New York. "I got done with high school, took a year off to write Teen Angst, then decided to go to Hunter because they let me in as a sophomore and paid most of my tuition. It lets me keep a more flexible schedule and, well, it’s got a whole list of merits in addition to the stunning, seemingly handpicked-from-the-world-stage female population." "Do: play video games. They’re so much better now than they used to be; they’re like entertainment on an entirely different level. I saw one video game called Morrowind that said on the back, ‘Live Another Life.’ That’s exactly what you can do with these things. Appreciate them. Don’t: Do ecstasy. It makes you stay short forever. All the kids I know who did a lot of it in high school still have high voices and height issues."